This month’s Recipe Redux theme is “beat the summer heat with no cook meals.” Summer is peak growing season for many fruits, vegetables and fresh herbs. While cooking can bring out a variety of flavors as well as enhance nutrients in some cases (i.e., cooked tomatoes have a much greater lycopene content than raw), there are times when it is great to just enjoy the bright, raw flavors of fruits, vegetable and herbs. And it has just been too hot for much cooking in my kitchen lately. 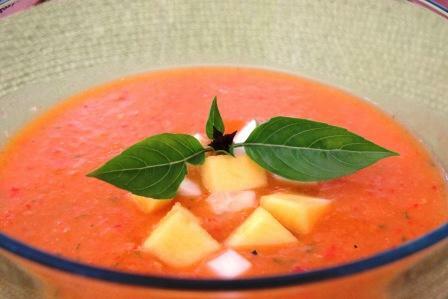 My mango gazpacho fits the bill perfectly. I first had this soup many years ago at a dear friend’s restaurant in Kamas, Utah. She shared the recipe with me and I’ve made it a handful of times, each time changing and improving upon it in flavor and nutrient profile (no lemonade in mine, thank you). This time I nailed it. 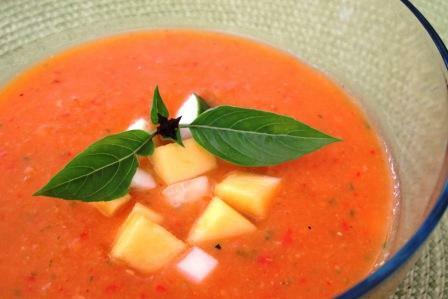 I hope you enjoy the velvety mingling of sweet and spicy in this delicious soup that is a great accompaniment to any meal. Place all ingredients in a food processor or blender and puree. Chill until ready to serve. Garnish with additional chopped cucumber and mango just before serving. Note: Depending upon the capacity of your food processor or blender, you may need to puree ingredients in batches.